InterSystems IRIS™ also provides specialized business service classes that use TCP adapters, and one of those might be suitable for your needs. If so, no programming would be needed. See “Connectivity Options” in Introducing Interoperability Productions. Also, you can develop a new inbound adapter class based on the EnsLib.TCP.InboundAdapter or any of its subclasses. See the section “Creating Custom TCP Adapter Classes,” later in this book. EnsLib.TCP.CountedInboundAdapter supports incoming TCP connections over which a TCP client and TCP listener exchange blocks of data, with the block length specified in the first 4 bytes of the block. The adapter uses the block length to acquire the meaningful portion of the data from the client application. EnsLib.TCP.CountedXMLInboundAdapter acts as a TCP listener for an XTE server. The adapter receives XML data in counted TCP format and imports the XML data into InterSystems IRIS. The result is an instantiated InterSystems IRIS object. EnsLib.TCP.TextLineInboundAdapter supports incoming TCP connections over which a TCP client and TCP listener exchange data as text strings that end with a line terminator character. The default terminator is the newline character (ASCII 10). 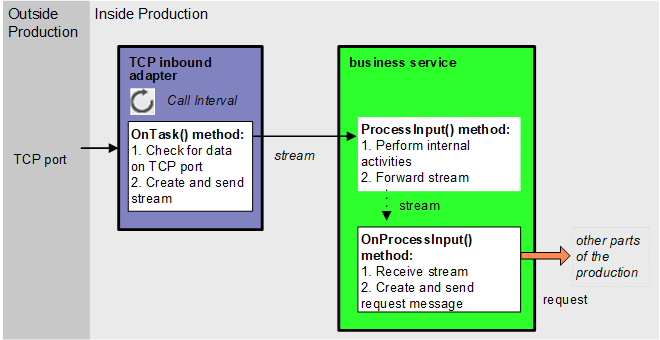 An important example of a business service that uses the EnsLib.TCP.TextLineInboundAdapter is the built-in business service class EnsLib.TCP.StatusService. This class provides a command-line interface that allows a console user or command-line script to retrieve basic status information from a running production. For more information, see “Adding a TCP Status Service,” later in this book. The ProcessInput() method then calls your custom OnProcessInput() method, passing the input object. The requirements for this method are described later in this chapter. To use any of the TCP adapters in your production, create a new business service class as described here. Later, add it to your production and configure it. In your class, the ADAPTER parameter should equal EnsLib.TCP.CountedInboundAdapter, EnsLib.TCP.CountedXMLInboundAdapter, or EnsLib.TCP.TextLineInboundAdapter. Your class can implement the OnConnect() callback method. This method is called each time the TCP inbound adapter establishes a new connection to or from a remote system. If OnConnect() returns an error status, the new connection fails and the adapter is disconnected. If an untrapped exception occurs within OnConnect(), the adapter catches it and continues as if OnConnect() were not implemented. Studio provides a wizard that you can use to create a business service stub. To access this wizard, click File > New and then click the Production tab. Then click Business Service and click OK. Note that the wizard provides a generic input argument. If you use the wizard, InterSystems recommends that you edit the method signature to use the specific arguments needed with the adapter you chose; see the next section. This section describes the method signature for OnProcessInput(), which depends upon the adapter, and describes how to implement this method. pInput contains the incoming data stream that the TCP client has directed to the adapter. pOutput contains any response that the business service might provide to the TCP client. pInput can be any of the objects specified by the Accept Class Names adapter setting. pOutput contains any response that you might need to return to the XTE server. pInput contains the incoming line of text. pOutput contains the outgoing response string (if any). Examine the input object (pInput) and decide how to use it. If the data source expects an acknowledgment or response to its input, OnProcessInput() must create this response and relay it to the data source, via the adapter. The following is an example of a business service class that uses EnsLib.TCP.TextLineInboundAdapter. When you configure the business service, you specify a value for the Allowed IP Addresses settings, along other settings. Note that Allowed IP Addresses provides a way to enable the adapter to initiate the connection.